(GAMEWEEK 3) at AnfiekdPark, Croydon, London. CROYDON - A victory in this game at Selhurst Park would have been uplifting for either teams after both Ian Holloway and Paola Di Cannio's clubs have suffered a rather uncomfortable couple of weeks. But it was Palace who came out on top, thanks to an early goal from Gabbidon and then a delightful strike from substitute O'Keefe to secure the win for Palace. 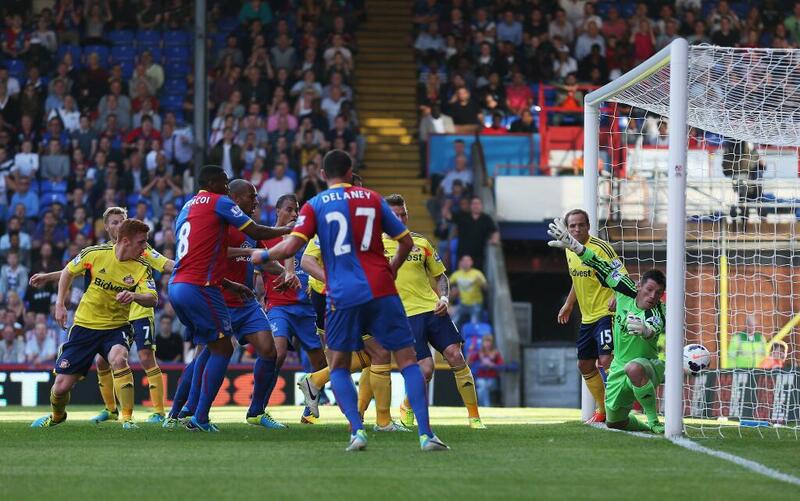 Palace squeeze the ball over the line to take an early lead. At the 9th minute mark, there was a scramble near the box as Campana swung in a corner, which dodged everyone at the near post until Dikgacoi got a small tap of the ball which then hits the ankle of Gabbidon, before crossing over the line in a truly bizarre and unpretty sequence. 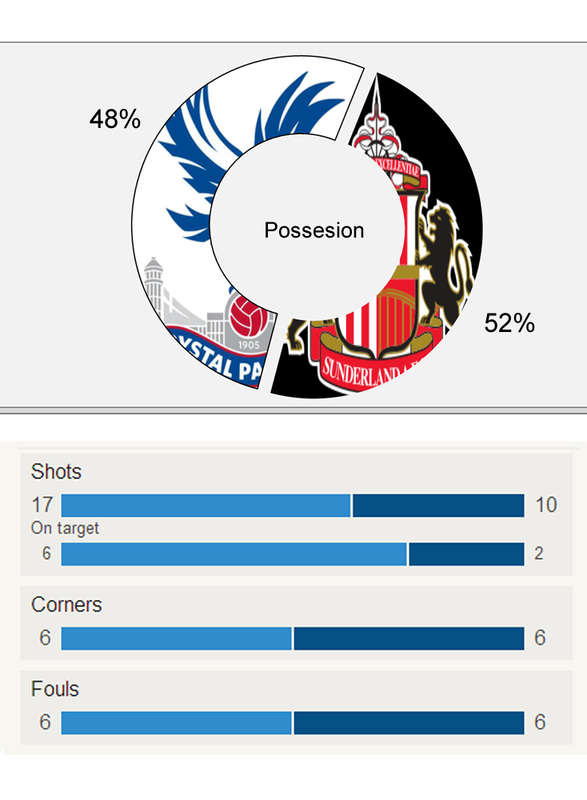 The first half was mostly Crystal Palace, moving the ball excellently around the deep Sunderland defence. The Saints did not just look out of sorts on defence, but also on attack, making little opportunities, in which was an abysmal display of football on their behalf. Going into halftime, it was obvious that Palace deserved the lead, and also that Di Cannio was not going to be a happy man in that locker room. 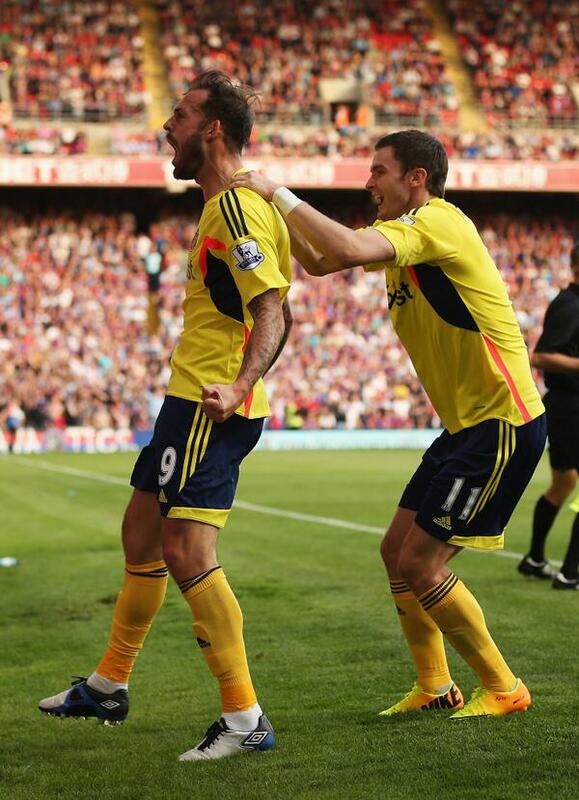 Fletcher celebrates levelling for Sunderland at Palace. The 2nd half consisted of pretty much the same as the first half, but after spurning many chances, Palace paid the price. At the 64th minute, Steven Fletcher, making his return from injury, marked his comeback with a superb header beating GK Speroni all ends up. Fletcher hung in the box, avoiding his marker and made sure that his header was going to cross the line with an emphatic attempt with a great result. 78 minutes in, and all to play for, skipper John O'Shea gives away a ludicrous foul, a loose, clumsy foul. The Captain received a red-card amidst elation from the Selhurst Park crowd as young forward Dwight Gayle, looking nervous, buries the penalty to give Palace the upper hand. Crystal Palace still clinging to the 1 goal lead, bring on Aaron Wilbraham & Stuart O'Keefe to protect the lead. In the closing stages, Di Cannio still optimistic, and angry, urged on his team, but it doesn't look like it's going to happen, especially with 1 man down. And that was right, as in the 91st minute, substitute O'Keefe scores an absolute fabulous left-foot shot off the underside of the bar from 20 yards. 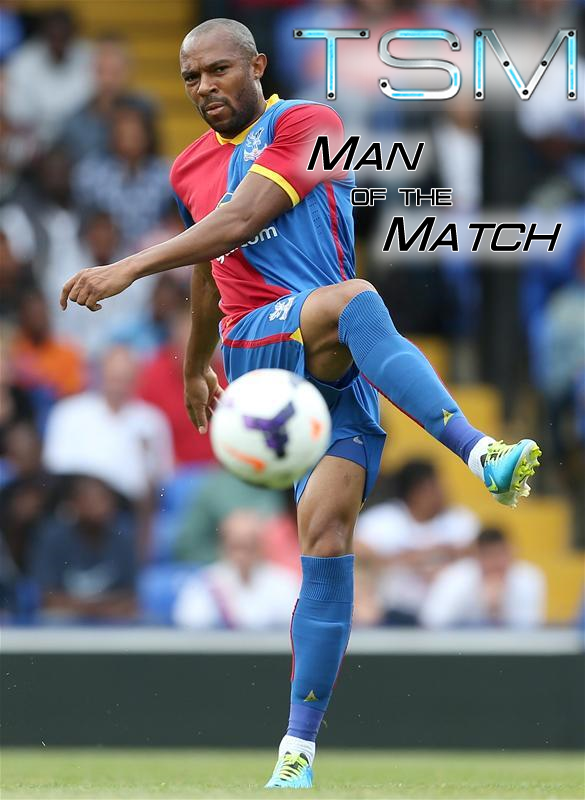 TSM Man of the Match - Danny Gabbidon. Crystal Palace will be happy with their performance after running the game fantastically on both sides of the field, and as for Sunderland, there are many questions to be answered. 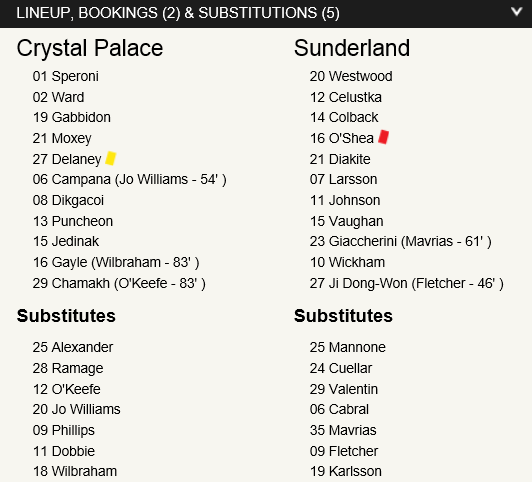 MATCH COVERAGE, RESULTS, FROM CRYSTAL PALACE VS. SUNDERLAND SAINTS IN GAMEWEEK 3 OF THE 2013-14 PREMIER LEAGUE SEASON.